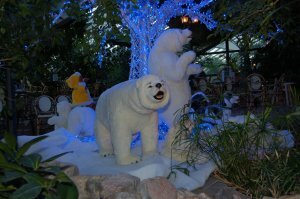 We’ve been to Center Parcs again this December, during the count down to Christmas period 2006. We had already been to a Center Parcs at Christmas last year – Holiday with a Baby, Center Parcs Sherwood Forest Nottingham UK, when our daughter was only a few months old. Our daughter was a bit older at 16 months, but just as demanding. This was our first visit to Longleat Forest, we’ve already visited all the other UK Center Parcs and one of the Center Parcs in the Netherlands. We booked last minute, and as a result there were only a few villas left. We had a 3 bedroom villa furthest away from the main pool plaza entertainment centre. The one negative thing about Center Parcs at Longleat Forest is that it is based across a big valley. Although the distance of the site is not too far it involves large downhill and uphill climbs. These involves either a large number of stairs, or for those using cycles or pushing push chairs or prams a lot of zig-zag-ing down a wooden path down and up the hills. Fortunately they also run a land train service, which runs every 20 minutes, and takes 40 minutes for a complete circuit (20 minutes each way from the pool plaza to the furthest stop). This meant that it was a bit inconvenient getting back to the villa to get changed etc. In future if we stay at Longleat I’m going to try and book early and get a more conveniently located villa. One of the main attractions of Center Parcs are their swimming pools. The pool at Longleat Forest is the best of the swimming pools. It is easily as good as the one at Sherwood Forest, which was the best activity swimming pool that I’d been to. The pools has a large pool with wave machine, a flowing circular river, two fast slides, two flume slides and a heated outdoor pool with a white water river ride (series of slides and flowing water). As with the rest of the Center Parcs the holiday was very children friendly. With good baby changing facilities at each of the buildings. Although there were not many activities for under 3’s except for expensive activities which are effectively a creche facility. They did have Baby Dolphins swimming session, where the pool opened early for under 4’s. They did include some inflatable toys to play with, but didn’t include a sing song that they had last year at Sherwood Forest. 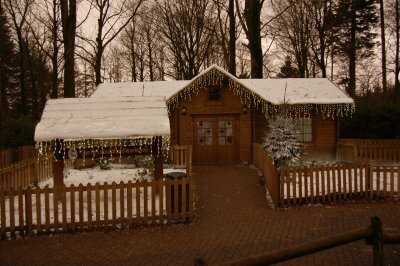 Santa’s workshop was located in the rangers lodge. The present wasn’t quite as good as the year before, but it wasn’t too bad. We got a small teddy dob. The visits to Santa could be booked in advance (so that you are not waiting), or in our case we turned up and paid on the first day of the holiday. This entry was posted on Tuesday, December 12th, 2006 and is filed under Babies, General, Holiday, Tourism. You can follow any responses to this entry through the RSS 2.0 feed. Both comments and pings are currently closed.